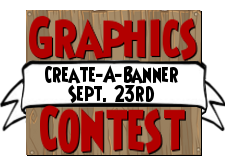 Create a banner using graphics. The banner must be 600px wide and say 12 Days of Autumn somewhere on it. Make sure to keep all graphics and words on the banner family friendly. Once you create your banner, submit it to secretsofthespiral@hotmail.com. Please include your pirate's name in the email and Graphics Contest in the subject line. All entries should be submitted by no later than September 24th (tomorrow) at 9am eastern. I'm sorry, but late entries will not be accepted. If you are under 13 years old, please get your parent's/guardian's permission before entering. The winning entry will be chosen shortly after 9am on September 24th and the winner will be sent an email with their code for one $10 Pirate101 gift card. I will also be posting the winning banner on the 12 days of Autumn page for the duration of the celebration. Good luck and have fun! Announcing The 12 Days of Autumn!